Peter McCory has been entertaining kids professionally since 1996. 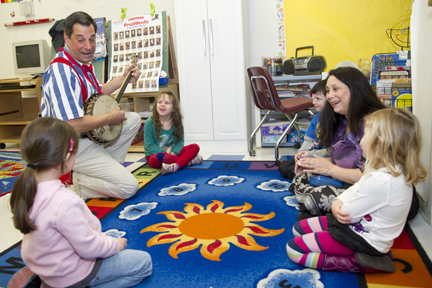 A life-long musician, he stumbled upon children's music by accident. 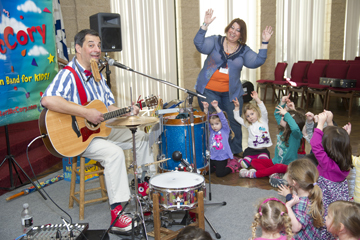 While working as a hospital public relations director, he was asked to provide some music at a hospital-sponsored health and safety day for kids. When the day finally came, kids flocked around to listen and watch him play in the hospital lobby. Peter was hooked. Never had he found such an eager audience. He had a strange feeling his music would never be the same. Today Peter performs several hundred shows for children a year. In between, he plays for adults, too. He has a special love of performing for seniors, and they seem to love his music as much as children do. Peter was inspired by one-man band Bob Devlin, known around Washington, DC for his street performances and love of children. When Bob passed away, Peter began experimenting with his own one-man band sound, building on what Bob had done. And he found that playing different instruments simultaneously was fun! He decided to try to keep Bob's memory alive with his own one-man band act. "I always tapped my foot when I played guitar, " Peter says. "I found out you could do a lot of things with those feet. One-man banding is kind of like toe tapping gone crazy. And it's crazy fun." Peter loves to write... especially songs. He's written hundreds of songs in numerous different styles over the years. He's also written several works for the stage which have been produced, including a musical play (he wrote the script and songs), dramas, comedies, one-acts and children's plays. 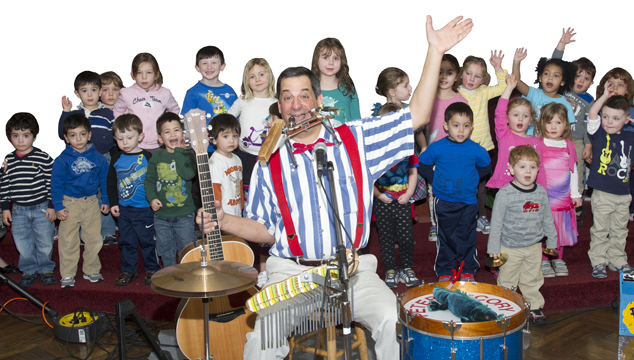 Peter's CDs of original children's songs have won Parents Choice Recommended Awards and favorable reviews in School Library Journal and Booklist (the journal of the American Library Association). Peter has another useful skill which came in handy. He grew up in his dad's workshop, and is very good with tools and tinkering. Many of the musical gadgets he plays had to be custom made in his shop. After all, you can't go to a music store and buy a gadget that lets you play snare drum with your foot. Some children get down on their hands and knees just to watch the levers and pulleys. Sometimes it's pretty obvious who tomorrow's engineers will be! Pete's music doesn't stop when there's no kids around. When not performing for kids, you will often find him playing bass with "Face Card Down," a classic rock/country band out of Haymarket, and the "Bristow Blues Band." He's also played guitar and led worship at churches and played drums for a swing band. Peter never intended to pursue a career in music or with children. He actually majored in biology at JMU, but never got to be the next Jacques Cousteau. So his career path drifted in a lot of different and fun directions. He got into radio broadcasting, and was on the air as an announcer at several DC area stations. He also helped start a radio station in his home town of Warrenton, VA, and continues to do a little voiceover work on the side. His radio experience got him into public relations, and for several years he was a media spokesman for a major metro area police department, before getting into hospital PR. But no matter what Peter found himself doing for a living, the music was always there, and just wouldn't go away. For most of his life a folk singer/songwriter who couldn't find a place to play, Peter says he just needed to find the right audience. And it happened when he discovered the joy of performing for kids. 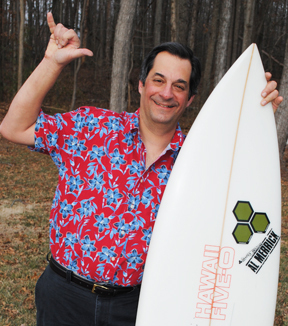 "I'm a person who needs to feel like what I do makes a difference in the world," Peter says. "I'm passionate about kids and music, so I'm blessed in being able to combine both into what I do for a living. It's been the most rewarding thing I've ever found to do with my life." According to a little research I've done, one-man bands have been around since the 13th century. And while you don't see many today, they were quite common during the Vaudeville era, performing on street corners and as part of stage shows. For the most part, one-man bands have been considered more of a novelty than serious musicians. People are intrigued because they are fun to watch, though some don't sound very good! I look at it a little differently. I think I'm a pretty serious musician, so the sound is everything to me. I'm not really interested in being a clown with multiple instruments, though I know those guys are pretty fun, too. To me, the music has got to be good! I guess when I first started experimenting with multiple instruments, I was mimicking Bob Dylan, who made famous the guitar and harmonica combination. But if you let your imagination go wild, you can find a lot of other instruments to add to your mix! The only limit is how many arms, legs and mouths you have. Children ask me all the time, "How can you play all those things at the same time?" It gives me a great opportunity to tell them that they do multiple things at the same time every day! A child playing basketball has to dribble, watch the other players, plot his or her strategy, run, work with teammates, and eventually shoot the basket. It's really the same thing! We're all used to seeing athletes do multiple things, so we don't think anything of it. It's a little more unusual to see a musician play multiple instruments simultaneously, but that is the joy of one-man banding! You get to be the rhythm section and play all the leads yourself... and you get to be lead singer, too. Doing something rather unusual also gives me the chance to talk to kids about the benefits of practicing something over and over again until you conquer it. Today's generation has been brought up on instantaneous reward! Microwave ovens are fast... today's smart phones are even faster! But no matter how much technology we have, there's always a special reward when you find something you'd like to do and work hard over a long period of time until you get it. No star athlete or prima ballerina ever got to be so good instantly. There just isn't any app for that! For me, part of the joy of performing as a one-man band is showing off the low-tech fun of acoustic instruments. Even though I use microphones, I don't play anything electronic. My stringed instruments, drums and woodwinds produce sound just as instruments have since the first human hit a log with a stick and said, "Coooool!" So I don't use drum machines or synthesizers. I like for the kids to see acoustic instruments in action. And if the power fails, I can still play! In this day of iPods, video games and computers, it's fun for me to show the kids that you don't have to have batteries or a wall plug to have fun. Long live homemade music!